Operation was one of my favorite games as a child. I made the Operation Game so that the nose/eyes lights up when an individual uses metal tongs to grab the different bone parts. It was completely hand made by both of us. I was the artist/designer and my husband did the technical parts. The Operation was made out of cardboard and I painted the "Operation" guy. Aluminum tins were wired in the back to make it "light" up. 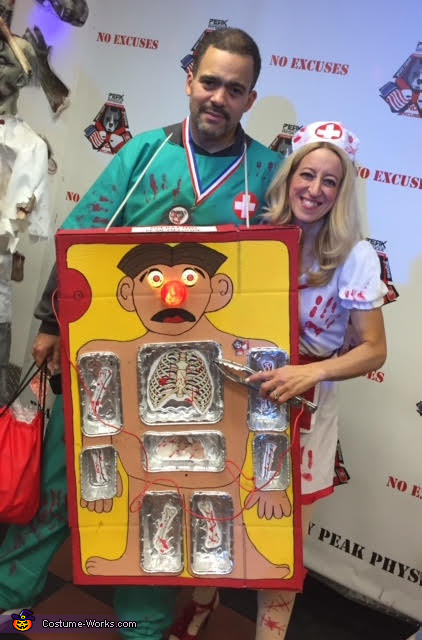 My husband and I dressed up as Doctor and Nurse to go with the costume. It as very inexpensive to make. It cost maybe the most $20.00. I recycled a lot to make the costume. The light used was made from Christmas lights and a clear ornament ball painted red. It was so much fun! It was a great hit with the kids as well!